Movies about scientists get made quite rarely, so by those standards 2014 was definitely a bonanza year for such films. First there was the excellent "Particle Fever" which is now available on Netflix. Particle Fever vividly conveys the excitement of doing science as opposed to, well, movie science. And it does this by focusing not just on the leading lights of the quest for the Higgs Boson but on the foot soldiers who carry out the daily, often tedious and uncertain work of shuffling through the data and picking out signal from noise. The champagne, celebratory hurrahs and Nobel Prizes are only the tip of an iceberg which has been solidly laying its foundation for years through the toil of ordinary men and women, and Particle Fever brings out this message exceedingly well. Particle Fever was followed by "The Imitation Game" which I saw last month. It's based on Alan Turing's definitive biography, Andrew Hodges's "The Enigma", and since I made the 'mistake' of reading the book before watching the movie I perhaps did not enjoy it as much as I could have. To its credit it gets several details right including a fair amount of detail regarding the actual Enigma machine. But where it errs in my opinion is in casting Benedict Cumberbatch as Alan Turing and Matthew Goode as his friendly rival. Now Cumberbatch and Goode are both fine actors, but the problem is that Cumberbatch is also a star, and in both achievements and personality Alan Turing was not a star, at least not until way after his death. It's a bit like casting Tom Cruise as Richard Feynman (who actually was much closer than Turing to being a star in real life). The movie also exaggerates a lot of things, including Turing's friendship with Keira Knightley's character and his authority over decision-making regarding whether or not to convey critical intelligence information to those manning the merchant convoys in the Atlantic. And while not exactly tiptoeing around his homosexuality, the film could have done a much better job of portraying how forthcoming and brave Turing was about that aspect of himself. Overall the effort is not bad, but it could have been much better if it had tried to be more of an honest biography and less of a box office hit. That brings me to "Theory of Everything" which I watched last weekend. I had avoided watching it for days, mainly because almost everyone I asked had told me that it was a little too sappy and mawkish and was basically a love story with little and botched attention paid to Hawking's science - all the wrong ingredients in my opinion in a movie about a great scientist. But with nothing better playing I decided to go ahead anyway. The first half of the movie seemed to confirm my worst fears: not only were there some sappy moments, but even more ominously the dialogue seemed leaden, the editing poor and the treatment of the science continued to be lazy (at one point there are copies of Nature with Hawking's photoshopped *face* on the cover - displayed in *bookstores*. I guess it's never too late for a scientist to fantasize...). But then something remarkable happens in the second half: it's almost as if a new director has appeared on the scene and the movie has undergone a complete midstream facelift. The dialogue gets better, and while many scenes are still sappy they are also full of heart. 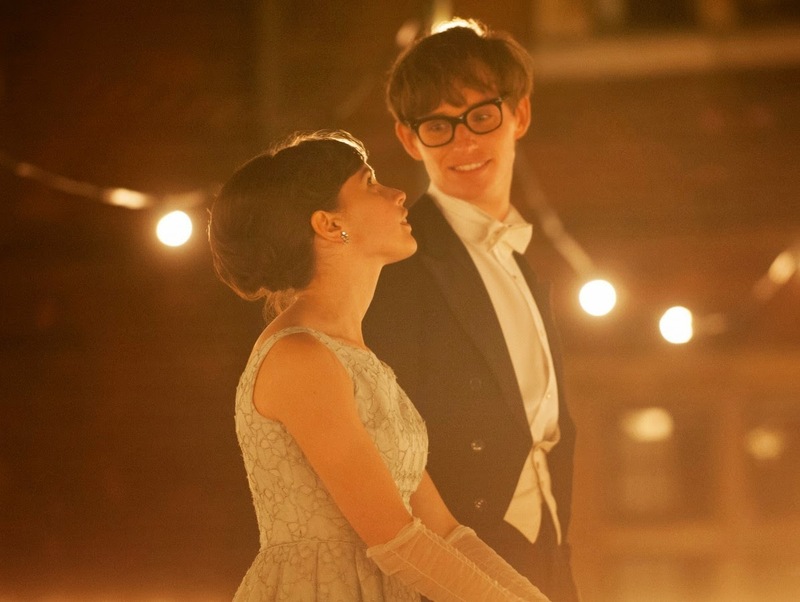 What really changes between the first and second half and almost completely redeems the movie's shortcomings are the astonishing performances by Eddie Redmayne and Felicity Jones as Stephen Hawking and his wife Jane. In this case unlike that of "The Imitation Game", the movie really benefits from having a relatively unknown actor play the role: although Mr. Redmayne's amazing facial expressions and bearing make it clear that he is a star in the making. But if anyone could be said to top his performance it's Felicity Jones. I cannot remember when, in recent memory, I have seen an actress who could convey so much through her face and eyes without speaking. Mr. Redmayne has an eminently deserved Oscar nomination, but Ms. Jones should undoubtedly get one for her performance. The scene where she and Hawking decide to part ways is one of the most touching scenes I have seen in a recent movie. The great achievement that the two actors manage to pull together is to paint the most human portrait of Stephen Hawking that I have ever seen committed to a public medium. Because of his brilliant mind and his almost surreal triumph over his disability, of all scientists Hawking especially is seen as a grand, legendary, distant character; perhaps the only contemporary scientist who inspires a reverence verging on the religious. Redmayne and Jones thankfully shatter this illusion and bring us a Hawking who is as human as the guy next door, who has the same follies and frustration and relationship issues as the rest of us. This true revelation alone makes the movie eminently memorable and worth watching. I hope to see movies on "the discovery of the structure of DNA"(could be a great movie); Pauling's, Paracelsus', Edward Teller's, Fritz Haber's lives as movies.